Asian equities fell on the last trading day of the week, Friday, August 10, as uncertainty over U.S.-China trade relations remains high. Japan's Nikkei 225 fell as most sectors were trading lower. Mining and insurance companies were at the forefront of the declines. Hong Kong's Hang Seng index fell, with services, technology and energy being the worst. The S&P/ASX 200 gave up its initial gains and dropped in the end. The energy sector caused losses, while the financial sector made little profit. In its monetary policy statement, the Reserve Bank of Australia said growth is likely to be above 3 per cent in 2018 and 2019. He also noted that inflation is likely to be a little lower in the short term. Pressure in Asia followed a mixed session in the United States on Thursday. The main Wall Street indices traded unchanged during the day before falling at the end of the session. Investors focused on solid corporate earnings for the quarter. Nearly 90 percent of the S&P 500 companies have reported quarterly results so far. Trade concerns have also been in the spotlight, with China announcing that it would retaliate against recent US tariffs. The dollar is on its way to the biggest weekly rally of 2017. Inflationary expectations and U.S. interest rates are expected to continue to rise. The weekly rise helped the dollar to record its first monthly rise against other currencies since February. Oil prices rose on Friday, due to concerns about U.S. sanctions against Iran. The escalation of the trade dispute between Washington and Beijing meant that prices did not skyrocket. Gold prices remained stable on Friday's Asian trading day, after falling from the previous session. It gained some support from global political tensions and a slightly weaker dollar against the yen. The party on Wall Street is shared by very few countries. The other countries do not seem to feel so immune to the trade war at the session on Thursday 9 August. They only keep pace with the Americans Israel, Australia, Saudi Arabia and Taiwan. Despite the good business results in the United States, what could be really moving the stock markets would be the strong buybacks! Even Japan doesn't keep up with the pace, and even though its stock market hasn't been around for a long time. Since its Central Bank bought its stock exchange etf's, causing a great distortion in the market. There was a negative European session on Thursday 9th August. European stock markets were weighed down by the trade war, which is experiencing new episodes with the US sanctions against Russia. The adoption of protectionist measures by the United States, and possible retaliation by its trading partners, has led to increased downside risks to the global economy. The ECB sees this as a major risk and warns that if Trump were to meet all its threats, the average US tariff would reach a 50 year high. There is still a need to monitor the risk of a high degree of volatility in the financial markets. China's consumer price index rose to a year-on-year rate of 2.1% in July. This is a two-tenths increase over the previous month. The rise in the CPI was largely due to an increase in non-food prices. Food prices rose by 0.5% from the previous year. The PPI or output price index, which measures wholesale inflation, grew by 4.6% in July and is one tenth less than last month. The second activated tranche of sanctions will be more serious than the previous one. It will be activated in 90 days if Moscow does not provide reliable guarantees that it will no longer use chemical weapons. It will also have to allow for on-site inspections by the United Nations. The second tranche could lead to deterioration in diplomatic relations, the suspension of Aeroflot's capacity to fly to the United States and a reduction in almost all exports and imports. The US decision has triggered a massive sale of Russian government bonds. News keeps coming in that Russia is selling American bonds and buying gold. Representatives of the European Commission and the US administration will meet on August 20 in Washington to develop the commitment of Jean-Claude Juncker and Donald Trump to increase exports of liquefied natural gas from the US to the EU. Asian markets fell on Monday, August 13, as investor sentiment was affected by the further fall in the Turkish lira. The risk of contagion from Turkish problems is not considered to be widespread in Asia. The Nikkei 225 fell as the Yen strengthened. This caused exporters' stocks to fall, with car and appliance manufacturers being the worst. Hong Kong's Hang Seng index fell, as all sectors experienced sharp declines. In Australia, the S&P/ASX 200 recorded slight losses. Thailand's markets closed on Monday for holidays. The downward movements in Asia came after U.S. stocks fell on Friday. 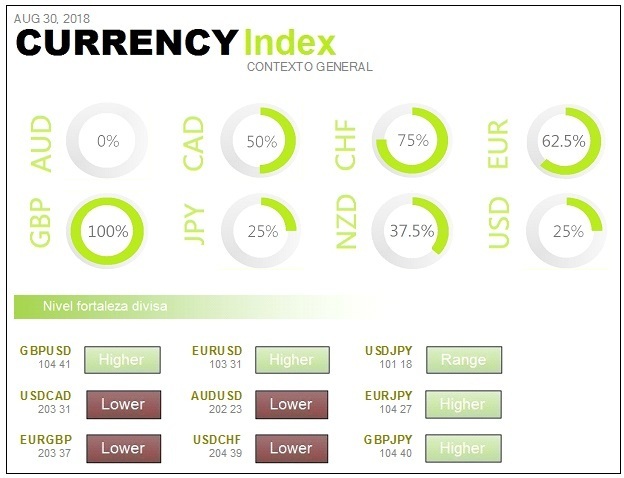 The EUR fell to a 13-month low against the Dollar on Monday as investors took refuge in safer assets such as the Dollar and the Yen. The most important thing for investors has been the sales of the Turkish lira, after the President of the United States said he had approved the doubling of tariffs on metals against Turkey. Oil prices fell during Monday's Asian session as rising trade tensions affect prospects for fuel demand growth, especially in Asia. U.S. sanctions against Iran continue to point to a tighter offer. Gold prices rose to a 13-month high against most of its major counterparts on Monday, as Turkey's financial crisis continues to weigh on the dollar. Wall Street closes in red in the face of escalating tension with Russia and Turkey. Russia has threatened the United States with resorting to 'other means' in the economic war. Wall Street ends with significant sales on Friday, August 10, in the last session of the week. In August there's always a guaranteed scare. Turkey gives the excuse. With the banking sector plummeting, European stock markets have been very nervous and in deep slumps, from start to finish, on Friday 10 August. The Old Continent is trading on five of its main stock market indices: Ibex 35, Cac Dax, Ftse and Psi. The tension between Russia and the United States, as well as the Turkish lira crisis, have been decisive in this situation. Trump's move to double metal tariffs in Turkey is just his latest blow against the NATO ally. It stems from disagreements over the defence policy and the arrest of the American pastor Brunson. Trump took office in search of better relations with Turkey. But when he announced his plans to raise tariffs on Turkish steel and aluminium to 50 and 20 percent respectively, he acknowledged that 'our relations with Turkey are not good at the moment'. Not content with his trade war with China, Trump has launched a new battle with Turkey and Russia, the consequences of which remain to be seen. August has already been a dangerous month for the markets in the past and it may be the same for 2018. The summer is going on, so far, with some peace of mind. However, in recent days an earthquake has struck with the appearance of two unexpected black swans. The case of Brunson, who is being tried as the orchestrator of the failed 2016 coup d'état, is now being compounded by a trade crisis. It is forced to say that growth is strong and widespread, although somewhat less strong than it has been to date. In addition to the economic data that are appearing, and that anticipate a global economic weakness, we have the Chinese, Japanese and Latin American economies. With most holiday investors, European Union stock exchanges have decided to launch an attack on important support references. The latest macro data confirms a change in trend. Factors such as lower taxes, higher inventories, anticipated demand or increased consumption have been the main factors responsible for the improvement in the economy so far. Monetary policy that is in the process of normalisation, but still in expansionary mode, also helps economic growth. Asian equities were mixed on Tuesday, August 14, as some markets in the region recovered after falling due to economic uncertainty in Turkey. The Nikkei 225 rose and all sectors traded higher, after the yen lost some of its recent strength following demand for safe havens. Exporters, including car manufacturers, and technology companies recovered. The South Korean Kospi index rose, with the technology sector showing a mixed tone. The S&P/ASX 200 rose, with the energy, finance and information technology sub-indices showing gains. Wall Street fell in the last session, with investor sentiment reeling as the financial crisis in Turkey unfolded. The Dow Jones fell, recording its fourth consecutive session in negative territory. The other major U.S. indices also ended the day with slight declines. On Tuesday's Asian trading day, the EUR hit a year low against the Dollar and Swiss Franc as the Turkish Lira rebounded. Investors fear that the fall in the lira could lead to capital outflows from emerging economies that have a large current account deficit and are dependent on foreign capital. However, for the time being there is consensus that the risk of contagion of Turkey's economic problems is probably not significant. Oil prices rose on Tuesday after an OPEC report confirmed that Saudi Arabia, the world's largest exporter, had cut production to avoid oversupply. On Tuesday, gold recovered from an 18-month low at the previous session, while the U.S. dollar rose to a 13-month high. Moderate purchases on Wall Street still pending the crisis in Turkey. Wall Street recorded very moderate gains on Monday, August 13, as the market continues to keep a close eye on Turkey's economy. Great political and economic instability has plunged the Turkish lira to record lows in recent sessions. While both the European Central Bank and US sanctions have led to the recent collapse of the Turkish currency, the currency has been depreciating for months now, above all, because of the Turkish Government's interventionism in the country's monetary policy. This puts doubts on the independence of its central bank. Fears of the contagion effect of the Turkish lira crisis dominate European markets on Monday 13 August. 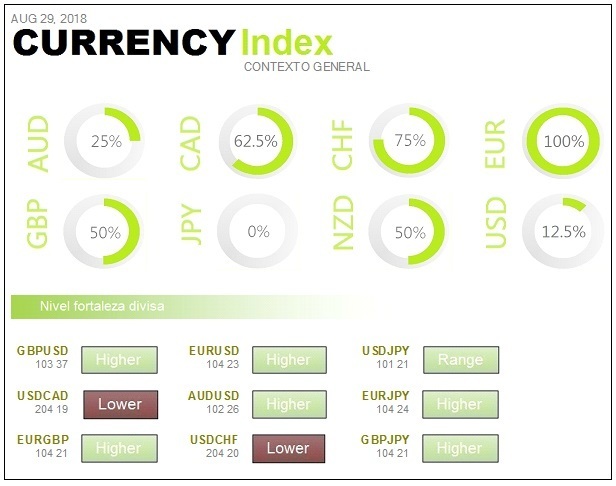 After red was installed on the world stock markets at the end of last week, the Ibex 35 is now 0.57% and the rest of the continental parquets are also listed in red. The highlight of this season's results is that many investors have questioned the valuation of companies in the technology sector, despite the good numbers they have published. Crude oil prices in the commodities market are dropping after emerging markets have reduced demand prospects. It sets it at 100.26 million barrels a day. It is an expectation that there will be no further escalation in the trade war. The group of 15 countries of the Organization warns that its forecast is that there will be no significant increase in trade tariffs and that the current disputes will be resolved. After an annual growth of 1.68% in 2018, the consumption of black gold on the planet will slow down next year. The supreme leader of Iran said, in response to the US president's statements, that he wanted to reach a new agreement. Ayatollah Khamenei criticized Washington's contradictory position in his speech. Trump was open last week to a new agreement with Tehran, after withdrawing from the 2015 multilateral nuclear pact last May. Amazon, Google and an assimilated Apple, are up about 0.5% in pre-opening. Nielsen Holdings is up almost 16%, after it became known that investor activist Elliott could become a shareholder. Netflix is in trouble and down more than 1.5% after the departure of its CEO. It’s the only FANG that doesn't come up. Asian equities fell on Wednesday, August 15, losing sight of the positive tone of Wall Street, with a strong dollar following the Turkish currency crisis. Hong Kong's Hang Seng index fell, with losses in the technology sector. The Nikkei 225 increased its losses after the almost 500-point rebound from the previous session. Most sectors traded lower, with the oil sector and coal products being the worst performers as black gold prices fell. The financial and technology sectors also experienced declines. The S&P/ASX 200 reversed its initial trend. The financial sector, strongly weighted, remained negative. U.S. stocks rose on Tuesday amid an overall improvement in expectations. Professional investors have once again been optimistic about US equities, with upward sentiment fuelled by a particularly good corporate earnings season. With the second quarter results season almost over, the S&P 500 companies collectively are on track to achieve a profit of 24.6 percent, compared to the same period a year ago. 79 percent have exceeded Wall Street's estimates. The Dollar held steady at a 13-month high against most of its major counterparts on Wednesday. It does so after fears that the fall of the Turkish lira might have boosted the Dollar. The strength of the dollar was reinforced by the fall of the euro, which has been affected by the exposure of European banks to the financial turmoil in Turkey. The Turkish lira fell back during Wednesday's Asian session after rising by around 8 per cent in the previous session. The rally in the lira gave European banks and other emerging markets a break. Turkey's Finance Minister, Berat Albayrak, said the country would protect its currency and added that he believed the lira would hold steady. Oil prices fell on Wednesday, due to rising oil inventories in the U.S. and a poor economic outlook. This fuelled expectations of lower fuel demand. In Wednesday's Asian session, gold fell to its lowest level since January 2017, while the Dollar rose to its highest level since then. Wall Street recorded a small rebound on August 14, after closing the previous session with moderate losses. The market is still watching closely for the outcome of the economic crisis in Turkey. The lira is appreciating against the dollar as it crosses the border and attempts to stabilize. Future U.S. stock markets were bullish, as concerns about the crisis in Turkey diminished for the time being. The Dow and S&P 500 have fallen for four consecutive days and the Nasdaq for two consecutive days. The banking sector has fallen by almost 3% in the last three sessions. The drop on 14th August was due to the contagion of the European banks, which were somewhat more affected by the Turkish problems. Now is the ideal time for the Central Bank of Turkey to intervene. It is clear from the central banks' manual when it is necessary to take measures to defend a currency. The ideal time is when the rebound comes. If a monetary policy measure is taken at that time, the effect is strongly amplified. The worst drop in emerging currencies since Lehman in 2008 is occurring. Maybe the issue of Turkey is more dangerous than we thought. The euro area economy expanded by 0.4% in the second quarter compared with the first. In year-on-year comparison, GDP increased by 2.2% in the euro area and the same rate in the EU. This level is lower than in the first quarter. The highest growth rate has been in Romania, ahead of Slovakia and Sweden. The weakest expansion has been in France and Italy. The German economy, for its part, accelerated slightly. The question is whether the crisis can spread to other developing economies and cause a collapse similar to that of the late 1990s. It is too early to draw any conclusions, although the last few days have seen the flight of investors from certain emerging economies. As a result, some currencies, such as the Russian rouble, the South African rand, the Mexican peso and the Indian rupee, have been affected. Large international investors have reacted as usual to a crisis such as the Turkish crisis. They are slowing down their operations in the countries on the periphery of the euro and taking refuge in central Europe. They have quarantined Spain and Italy until the situation is resolved. The main reason for this is the exposure of the banks in these countries to Turkey. Today, thousands of day-to-day operations and services use machines to process information and make decisions. The financial sector has not lagged behind and algorithms are enabling new forms of investment and portfolio management. The data is managed by algorithms that analyze financial behaviour patterns to generate different predictive analyses. These answers are the basis of some of the star products of the social trading community. The technological solutions based on Artificial Intelligence range from the use of technical analysis to pattern recognition. They use predictive algorithms to select which instruments to include in a portfolio, which to underweight and which to overweight. Automatic learning has made these systems so expert in pattern analysis and recognition that they can match, and even surpass, some of the world's best analysts. Asian equities fell on Thursday, August 16, but reduced some of the losses previously recorded after China announced that it was planning a new round of trade talks with the United States. Beijing said it had accepted an invitation from the United States to participate in trade negotiations in late August. China's Deputy Minister of Commerce, Wang Shouwen, will lead the Chinese delegation. The Asian country is against unilateral solutions and protectionism, but is open to dialogue. Chinese markets reduced their losses after the news. South Korea's Kospi fell, as its technology sector was mixed. The ASX 200 went down, with energy and materials leading the way as raw materials fell. The losses in Asia were also due to the fall in US markets. Technology actions in the United States were under pressure throughout the session. Concerns about Turkey's currency crisis took a back seat after the country's currency fell to an all-time low earlier this week. The U.S. dollar rose to a 13-month high during Thursday's Asian session as risk aversion eased and emerging market currencies recovered following news that a Chinese delegation will travel to the United States in late August for trade talks. On Thursday, oil prices recovered some of the previous day's losses after Beijing said it would send a delegation to Washington in an attempt to resolve trade disputes between the United States and China. On Thursday's Asian trading day, gold fell to a 19-month low. The hedging of short positions was decisive. U.S. stocks fell on Wednesday due to lower technology stocks and investor sentiment. U.S. stocks followed the stock market rally in other areas on Wednesday, June 15. All sectors sensitive to the trade war have suffered a great deal, especially after the Chinese have been known to denounce the United States to the WTO for several of the tariffs imposed. Emerging crisis and trade war blow fuses to European stock markets. Was a very negative and bearish day in Europe on Wednesday 15 June, with losses in many indices close to 2%. The Turkish crisis has eventually spread to the emerging economies. The Turkish Central Bank has implemented a series of measures that have caused the closure of short positions in the lira. Nothing can be ruled out any more, including a playpen, such as the capital flight that the country must already be suffering on a massive scale. Turkey is following the pulse of the United States and has today doubled its tariffs on goods by some $500 million. The Asian stock markets closed Wednesday's session in red, marking their lowest level in a year. The Japanese Nikkei finished with a 0.68% decline. But the worst part was taken by the Chinese stock market, following the heavy punishment of the technology sector and after the yuan plummeted to its lowest level since May last year. The European indices are not able to get rid of the doubts. The Turkish crisis is still very much present on the markets and the Old Continent is no exception. 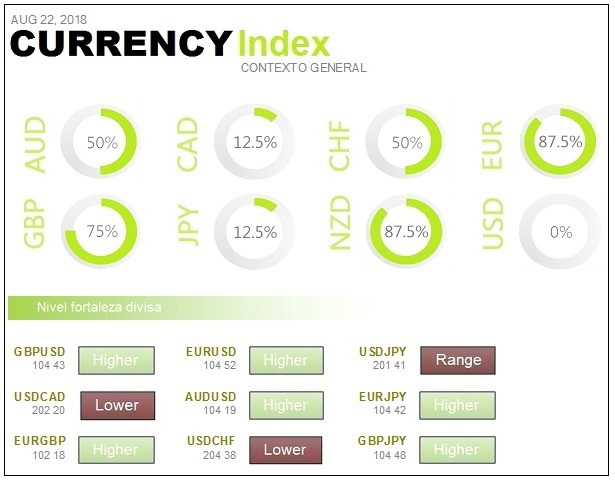 The Ibex, which on Tuesday tried to bounce back but failed to do so, and the rest of the European indices continue with the same tone as in recent days. The Saudi investment vehicle has already deployed a third of its committed capital. The value of the Public Investment Fund, the Saudi sovereign wealth fund, ranges from $200 billion to $300 billion. It includes assets such as a 70% stake in Saudi Basic Industries, which is one of the world's largest petrochemical companies. Tesla's funding for its delisting is still not secured. Elon Musk's car may lose the support of the Saudi sovereign wealth fund, which he had in mind. The market is skeptical that it will increase its stake in the Company beyond the 5% it acquired last week. British Foreign Secretary Jeremy Hunt has urged the European Commission to change its approach to the Brexit negotiations. We have put some very serious proposals on the table, but we need to see a change of approach on the part of the EC if we are to reach a pragmatic agreement that works for all. On Friday 17 August, most Asian markets advanced. They did so after the strong leadership of Wall Street and the positive news on the U.S.-China trade front. The Nikkei 225 rose, with most of the major sectors in Japan rising, especially the shipping sector. In South Korea, the Kospi rose, with the technology industry in mixed territory and the automotive sector in decline. The ASX 200 rose very slightly, as major mining companies fell. The Hang Seng index rose, supported by the financial sector. The movements in Asia came after Thursday's rally in the U.S. markets. There was some positive news there. They range from corporate profits to reports of a revival of negotiations between the United States and China that will hold a new round of trade talks in late August. Investors are now hoping that the world's two largest economies can resolve their current trade dispute. The Dollar climbed to a 13.5 month high against its major counterparts on Friday's Asian trading session. The Turkish lira, after hitting an all-time low on Monday, was slightly better. However, U.S. Treasury Secretary Steven Mnuchin said more economic sanctions could be imposed on Turkey if it did not hand over the detained U.S. pastor Andrew Brunson. During Friday's Asian session, Crude Oil prices fell and are heading towards their seventh weekly drop. Growing concerns about the slowdown in global economic growth could affect demand for oil products. Gold rose sharply on Friday's Asian trading session, while the Dollar remained strong. Wall Street bounces off new U.S.-China negotiations. The world's two largest economies have resumed their tariff talks. The market reacted positively on Thursday, August 16, to the news that the United States and China have resumed their negotiations in the midst of a trade war. Wall Street is also being driven by the European squares, which are also bouncing back after freeing themselves from some of the tensions surrounding the Old Continent in the midst of the Turkish crisis. Asia closes in red and Europe trades in green. The Old Continent is listed in green on Thursday 16 August in five of its main stock market indices: Ibex 35, Cac 40, Dax 30, Ftse and Psi 20. In the case of the Spanish selective, the Ibex is trying to rebound from the annual lows. The operator Equinor Energy, which has a 36% stake in the Gudrun field, has discovered a new oil and gas well in the Gudrun field in the North Sea. Also participating: Neptune Energy Norge (25%), OMV (24%) and Repsol (15%). According to the Norwegian Oil Board in a statement, this well was drilled about 10 km southeast of the Gudrun field in the North Sea and 225 km west of Stavanger. The results of this drilling are still preliminary, as no comprehensive data collection and sampling processes have yet been carried out. Companies licensed in this field will have to assess the profitability of the discovery, as it has not yet been determined whether the product is valid for commercialization. It indicates that a'no deal' could change customs, trade and economic activity. He adds that he sees the possibility of a lack of agreement as very real. The chances of that happening are increasing. The Turkish Finance Minister defended the soundness of the country's banking sector and stressed that no significant outflow of deposits from institutions has been detected. Berat Albayrak said that Turkey will emerge stronger from the current period of volatility. He also pointed out that the Ottoman country would not consider imposing capital controls or seeking assistance from the International Monetary Fund. They do so in response to the dirty war against the free press and the constant attacks on journalists. More than 300 U.S. newspapers have published joint editorials defending press freedom and the importance of independent journalism. Asian markets were mixed on Monday, August 20, after an upward session ended on Wall Street on Friday. A report announced that China and the United States are working on a plan to end their trade dispute. The negotiations will conclude with a meeting between President Donald Trump and Chinese leader Xi Jinping in November. A nine-member delegation from Beijing will meet with U.S. officials August 22-23. Last Thursday, the two governments announced low-level trade talks later this month with the aim of resolving their tariff escalation. The Japanese Nikkei 225 fell, while the Topix also fell with most major car manufacturers in negative territory. Hong Kong's Hang Seng index rose with its main shares in positive territory. Australia's ASX 200 fell back after its first winnings, ending unchanged. The materials sector rose, while the financial sub-index fell. Meanwhile, the shares of the main mining companies were listed on positive territory. The Dow Jones Industrial Average rose on Friday after it was announced that negotiations will end with a meeting between President Trump and Chinese leader Xi Jinping in November. The Dollar fell on Monday as demand for safe-haven currencies was affected by optimism about the easing of trade tensions between China and the U.S. as a result. There was some movement in the forex market, where the Australian dollar and New Zealand dollar recorded strong gains. Oil prices fell on Monday as concerns about the slowdown in economic growth weighed on the markets. China's disappointing industrial data, coupled with concerns about emerging market economies, centred on Turkey, weighed on commodities. On Monday's Asian trading day, gold rose sharply as U.S.-China trade tension affected the Dollar. This added pressure to demand for the yellow metal, which improved over the past week as prices reached a 19-month low. New U.S.-China trade negotiations keep the market in suspense on Friday, August 17. The American market rebounded on Thursday, driven by new trade negotiations between the world's two largest economies. The trade war is being the big backdrop in the markets. China recently stated that it would accept dialogue between the two countries, but warned that it would not consent to any unilateral action by the American country. Grey farewell to the week of European stock markets. The very negative week that has closed in Europe on Friday 17 Augustt. The background to European trade wars and political entanglements has been lethal to European stock markets. In addition, emerging markets have also performed poorly, especially the Chinese stock market. The annual inflation rate in the euro area rose to 2.1% in July, up from 2% in June. In the European Union as a whole, the year-on-year increase in prices stood at 2.2%, compared with 2.1% in June last year. A year ago, the euro area recorded year-on-year inflation of 1.3% and the EU as a whole of 1.5%. The largest price increase was recorded in the energy sector, with a year-on-year increase of 9.5%. U.S. threats of further sanctions against Turkey if it does not release Pastor Andrew Brunson. Next week is a holiday in Turkey, which is scary for investors as they could get caught up if new events happen. The good news is that the planned meeting between China and the United States has defused the tension so far. The United States threatens Turkey with new economic sanctions. The Turkish lira, which had been recovering strongly for three days, has fallen again by around 5%. At times it has fallen by more than 7%. S&P is going to review the Turkish rating. And there's a fear that I might bring it down after the latest events. The Italian ten-year bond yield is sending a dangerous signal. It's approaching levels not seen since the May peak. Investors'confidence in the new Italian government is nil. Their stock exchange can attest to this, as it is one of the worst in Europe. Most Asian markets rose on Tuesday, August 21, after gains from the Wall Street session. This week, investors will be watching the trade talks between U.S. and Chinese representatives. In Japan, the Nikkei 225 reversed the initial losses to end up on the upside. The Topix index traded almost unchanged. In Australia, the ASX 200 index fell and most sectors fell. China's markets also showed positive territory. Chinese equities rebounded after the banking regulator encouraged lending to support infrastructure projects and exporters. China's biggest risk may be its housing market, not the trade war. China's troubled real estate market remains a challenge for the authorities, who are trying to maintain stable economic growth despite trade tensions with the United States. 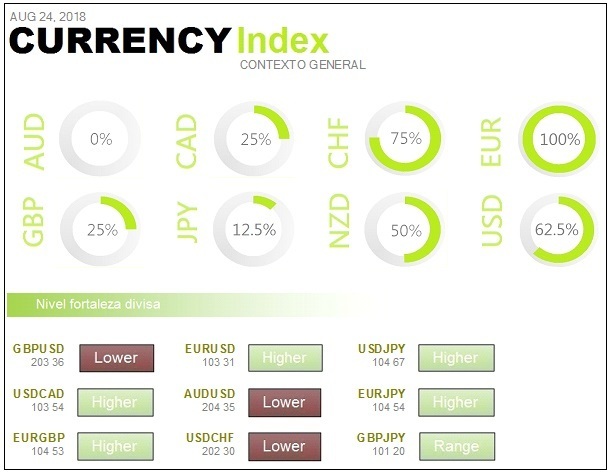 The trend of the dollar changes against a basket of major currencies. It does this after President Trump said he disagreed with Federal Reserve Chairman Jerome Powell on the interest rate hike. The Australian dollar appreciated following the release of the minutes of the August monetary policy meeting by the Reserve Bank of Australia. The central bank said that, as progress on unemployment and inflation continues as planned, there are no compelling reasons to adjust monetary policy in the short term. Oil prices were mixed during Tuesday's Asian session. The trade dispute between China and the United States affected international oil contracts. Gold rose during Tuesday's Asian session, extending gains for a third straight session after Trump criticized the Federal Reserve for interest rates. Dow Jones is being helped by the great negotiating activity. U.S. stocks rose on Monday, August 20, as investors were very active and major indices approached record levels. This week could also be special for Wall Street. Wednesday marks 3,453 days of bull market and some analysts think it is the longest bullish streak in the index's history. Optimism allows Europe to start the week off on the right foot. Generous spikes in the European market on Monday 20 August, where most of the supersectors are in positive territory. Optimism remains about that new step between the United States and China. In the fixed income market, there are money outflows from Germany's debt, moving to the periphery, and sharp rises in ten-year Spanish and Italian debt futures. Investors are wary of U.S.-China negotiations that could ease tensions between the world's two largest economies. The EUR fell against most of the major currencies on Monday, as the Dollar rose against most of its major currency pairs. The talks between Chinese and U.S. officials in Washington will take place in the coming days. Analysts say the attendees will be lower-level officials, although there are high hopes that the talks could be a step forward. The escalating trade tensions between the United States and its trading partners, in addition to the fall in the Turkish lira, have boosted the dollar and severely affected emerging market currencies. Baker Hughes' count of oil installations leaves an overall figure unchanged. There is no increase or decrease in the number of new installations. This should leave neutrality in view of its effect on the price of crude oil, but it should be framed within an almost absolute stability from the end of May. It is not positive, both in the evolution of the price of crude oil and the outlook for demand in the medium term. Greece officially concludes its last successful financial assistance programme under the European Stability Mechanism. This is the Agency responsible for the three-year plan that has enabled the disbursement of EUR 61.9 billion to Athens. MEDE described Greece's exit from the programme in a statement as 'successful'. With it, it has benefited from support to address macroeconomic adjustments and the recapitalization of its banks. The Luxembourg-based Agency recalled that it did not need to disburse the EUR 24.1 billion available within the EUR 86 billion limit of the programme. Greece thus concludes the financial assistance package agreed by MEDE members in August 2015. According to IMF experts, an aid programme for Turkey would require between $30 billion and $70 billion. The German government has recommended that the Turkish government accept this aid programme to stabilise the Turkish lira. German Finance Minister Olaf Scholz had a telephone conversation with his Turkish counterpart Berat Albayrak on Thursday and encouraged him to reconsider the rejection of a possible bailout. Asian markets were mixed on Wednesday, August 22, as investors reacted to political developments in the United States. Donald Trump's former personal attorney, Michael Cohen, pleaded guilty in federal court to eight counts of tax fraud, illegal campaign contributions, making false statements to a financial institution and illegal corporate contributions. He could face over five years in prison. Two of the charges Cohen testified on are reportedly directly related to Trump. He admitted that he made payments to favour the election of an unidentified candidate, who appears to be the president. Those payments, Cohen said, were made to influence the outcome of the election. Australia's ASX 200 fell, with sectors such as utilities and the financial sub-index being the worst. In Japan the Nikkei 225 rose, while the South Korean Kospi did the same. China's markets moved into negative territory. The S&P 500 reached its all-time high on Tuesday and reached its longest ever bullish market record. Investors bet that the strengthening of the economy and booming corporate profits will continue, despite the recent trade battles. The Dollar fell during Wednesday's Asian trading session. Trump's comments on monetary policy continued to affect the currency. Investors are now eagerly awaiting the China-U.S. trade talks and the release of the Federal Reserve Minutes. On Wednesday, oil prices rose, supported by a drop in U.S. crude oil inventories and as a possible Iranian oil deficit, starting in November, adds to the bullish tone. Gold prices rose to their highest level in the past week during Wednesday's Asian trading session. It does so after Trump attacked the Federal Reserve for interest rate hikes. Future U.S. stock markets pointed to modest gains at Tuesday's opening. U.S. stocks traded higher on Tuesday, August 21, with the current bullish market on its way to becoming the longest in history. The bullish market turns 3,453 days on Wednesday. Second improvement of the week thanks to Trump and Moody's. Bullish session in Europe on Tuesday 21 August, which joins that of Monday. 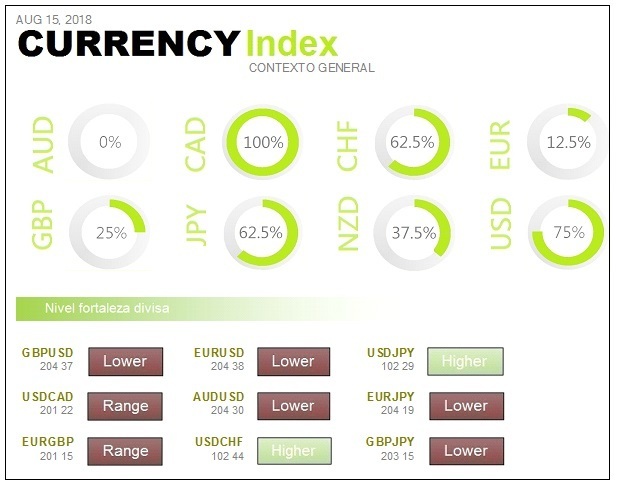 European indices are moving away from the month's lows and following in the footsteps of those generated in the United States. Although Trump had no hope that the new talks between China and the United States would be successful, European markets have not been affected. In addition, the US president has once again messed with the monetary policy of the Federal Reserve, criticising the interest rate hikes. The rating agency Moody's has put on hold the review of Italy's credit rating. They hope to be clearer about the country's fiscal and spending path. For now, the markets are breathing. On Monday, markets responded well to the news that the U.S. and China continue to have meetings to reach an agreement and avoid a trade war. But Trump says Tuesday that he doesn't have much hope of making much progress at those meetings. The meeting between low-level officials from the two countries begins on Wednesday. On the same day, the Fed's minutes will be published. Both events will cause the markets to react. To top it off, Trump again says he disagrees with the Federal Reserve's interest rate hikes. The central bank meeting in Jackson Hole will take place shortly and many expect Powell to make some kind of announcement: on the prospects for the economy, the trade war or on the acceleration of rate hikes. On the other hand, while the United States is showing signs of an expanding economy, Europe is experiencing the opposite. Peripheral countries, such as Spain or Italy, are involved in a great deal of political uncertainty that has a negative effect on their economies. As an example, Spain relied on exports to overcome the crisis. These exports were heavily dependent on car production, which is now in the midst of a sales crisis. In addition, we will see how currencies are evolving. The Dollar is damaged by Trump's comments, which in turn will strengthen the Yen and Euro. This is not favourable for exporting companies. The Central Bank says that they will improve the coordination of monetary policies and that they will alleviate the financial problems of companies. They intend to make policies flexible and effective. As a new thing, they say they are asking local authorities not to give subsidies on steel imports and exports to companies that violate World Trade Organization rules. They also say that local authorities should not create policies that support the illegal expansion of steel capacity. The Chinese housing market remains a challenge for the authorities, who are trying to maintain stable economic growth in the face of trade tensions with the United States. In fact, real estate is the country's biggest risk in the next 12 months. A much greater risk than the trade war, according to Larry Hu, chief economist of Greater China at Macquarie. They are particularly alert to whether the real estate market, in smaller cities, will see a drop in prices, or the construction of new homes, after the recent increases. With regard to graphics cards, the Company is beginning to recognize that, in the future, it does not see much impact and support from the cryptomarket. Given the puncture Bitcoin has had, mining is not at its peak of popularity. The current demand for graphics cards is shrinking. However, many believe that other areas of the Company's business will soon take over, because the latest figures presented show promising growth. Asian markets showed a mixed tone on Thursday, August 23, with investors watching trade talks between Beijing and Washington amidst the imposition of new tariffs on Chinese products. China's markets were showing negative territory. Hong Kong's Hang Seng index fell and the materials sector was the worst. The Shanghai composite index is down. In Japan, the Nikkei 225 traded in positive territory. South Korea's KOSPI was weak. The ASX 200 also decreased slightly. As Wall Street weighed the importance of the new political revelations surrounding the President and the strength of corporate results, the US markets ended the day in mixed territory. The Dollar is rising on speculation the Federal Reserve will raise interest rates. The Australian dollar weakened during the Asian session, while Prime Minister Malcolm Turnbull faces another challenge to maintain his party's leadership following the resignation of Finance Minister Mathias Cormann. Oil prices fell during the Asian session, affected by the escalation of the U.S.-China trade dispute. Although the fall in U.S. crude oil inventories offered some support for the prospect of further rises. Gold prices rose to a week high on Thursday as fears of a new round of tariff measures against China, along with expectations of a rate hike, boosted the Dollar. Wall Street quotes flat after the latest Trump scandal. Wall Street trades flat on Wednesday 22 August on its three main stock market indices. The market suffers from the latest scandal involving Donald Trump, who commissioned his lawyer to silence two women. Trump has returned to the limelight after Michael Cohen, the former attorney for the U.S. president, turned himself in to the FBI after reaching an agreement with the prosecution. He is investigated for tax and bank fraud and violation of the electoral law. Cohen has claimed that the president ordered him to commit a crime. A lot of movement in a waiting session. Bullish session in Europe on Wednesday 22nd August, in a situation of general expectation and with events that have given much movement. We are very close to the start of the annual central bankers' meeting in Jackson Hole. Any comments they make about the development of the world economy and about the trade war will be scrutinized there. The week is within the area of influence of the main events of these days. Wall Street had another good session on Tuesday in the hope of an agreement with China to stop the all-out trade war. Trump, criticize the Federal Reserve for raising interest rates. If the Fed lets itself be influenced, credit will not become more expensive and this will be good for the U.S. economy. Cohen accuses Trump of ordering him to commit irregularities. Many see the legal siege on the current president of the United States narrowing and no one knows what may happen. The market is now in standby mode, as the Fed's minutes from its last meeting are published and voters' agreements or disagreements on monetary policy will be scrutinized. The central bank event in Jackson Hole is also coming up. Investors will be attentive to any comments that may be made, both at conferences and in interviews and corridors. The European Union and the United Kingdom have started a new formal round of negotiations on the Brexit. Both sides are committed to intensifying efforts in the coming weeks and to continuing negotiations to reach an agreement. However, the positions are still far apart and the deadline is approaching. If the United Kingdom leaves the European Union without an agreement, trade between the two economies could be severely affected. This would be the scenario most feared by companies and investors. In the UK they even fear that it could affect the provision of medicines and basic foodstuffs. Both the British and the Europeans are talking about intensifying the dialogue and doing so on an ongoing basis. Trump's back at the center of the hurricane. The US president announced that he will unilaterally raise tariffs on vehicles imported from the European Union to 25%. The Spanish tourism sector is, and will be, one of the main victims of the Turkish lira crisis. The devaluation of the Turkish currency, 25% in August and 40% throughout the year, has made the country's prices more attractive to tourists. Asian markets were mixed on Friday, August 24, as investors reacted to the escalation of the U.S.-China trade war, developments in Australian policy and economic data from Japan. In Australia, the ASX 200 rose as Australian politics took centre stage in Friday's session. China's markets fell in the middle of the session. The Hang Seng index fell, with losses in most sectors. Japan's consumer prices rose 0.8 percent in July from last year, but remained unchanged from the previous month's gain. That figure was slightly below market expectations and is still far from the Bank of Japan's 2 percent inflation target. Trade talks between U.S. and Chinese officials ended Thursday with no progress. The United States and China intensified their trade war by implementing new tariffs of 25 percent on $16 billion each on goods. This has made investors tremble. The Asia session followed a slight drop on Wall Street, where the ongoing U.S.-China trade war and concerns over Donald Trump's legal issues were weighing on investor sentiment. The Dollar fell on Thursday's Asian trading session. Meanwhile, the Australian dollar saw a sharp rise. Oil prices stabilized in the Asian session on Thursday, while the escalation of the U.S.-China trade dispute offset the release of an upward report on U.S. oil reserves. Gold fell in the Asian session on Thursday after the Federal Reserve reaffirmed its intention to raise interest rates and as U.S.-China trade tariffs return to the upside. Reading the Federal Reserve's minutes has left almost everyone dissatisfied. On Thursday 23 August, the market reacts to the release of the minutes of the last meeting. While they continue to say that the economy is doing very well, supporting the thesis of gradual increases in interest rates, the warning that the tensions caused by the trade war could derail the American economy is very notorious. A great deal of caution is already being exercised as to what might happen if all central banks start to engage in an escalation of interest rate hikes and the trade war begins to deteriorate the economy. Weidmann of the Bundesbank praises the German economy's boom. Weidmann says the German economy will continue to grow but not at the pace of 2017. He called for an end to the current monetary policy, because inflation has already reached the target areas of the European Central Bank. The European market remained strong on Thursday, August 23rd, due to the increase in profits, dividends and also due to the repurchase of own shares. Questions arise as to whether the American president could now be prosecuted, although that scenario seems unlikely. The political storm reached new heights Tuesday with Trump's former campaign manager, Paul Manafort, and his former attorney, Michael Cohen, testifying in separate courts. Both have been convicted of irregularities involving Trump. According to J.P. Morgan, the recent divergence in US equity performance from the rest of the world is unprecedented in history. 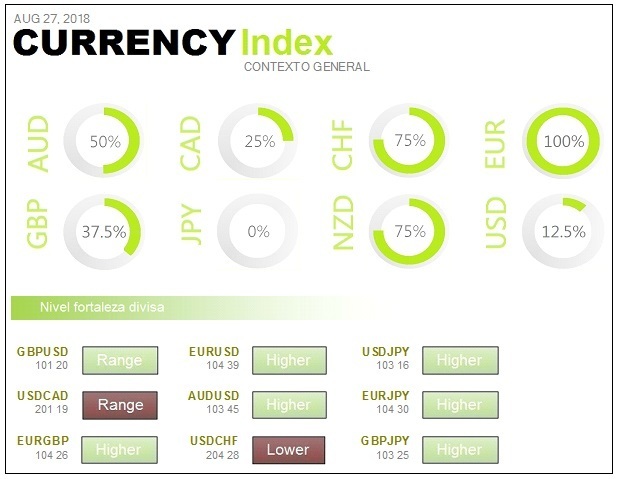 It turns out that the performance of the indices is much more positive in the United States than in Europe and emerging markets. This has never happened so markedly before. A major concern is the downward revision of the ten-year yield forecast at the end of this year. Especially in the United States, the United Kingdom and Germany. In the current economic boom, central banks should raise interest rates. There'd be no point in reducing them. It is necessary to prepare for a future crisis, where high rates can be lowered to boost the economy again. This rise is justified this time: Good business results have come out. When tax reform was yet to be approved in the United States, many people said it would not have much impact on the American economy in the long run. They said that the reduction in corporate taxes would be invested in shareholders through the distribution of dividends. What we see today is that the distribution of dividends is used to buy back our own shares. This effect is taking place today and many believe that it is prolonging the bullish movement for a longer time. Asian markets were very positive on Monday, August 27, with China gaining ground after the move by its Central Bank to lead the management of the yuan. Analysts saw this as a way to slow the decline of the currency. The People's Bank of China announced that it was modifying its methodology for setting the daily average value of the yuan in an effort to stabilize the value of the currency. China has recently been deliberately loosening its exchange rate to compensate for the problems arising from the trade war. Hong Kong's Hang Seng index was bullish, with all its major sectors in positive territory. The Shanghai compound also traded higher. The Japanese Nikkei 225 rose, with almost all sectors in positive territory. In Australia, the ASX 200 rallied in the end, after trading on negative territory early in the day. The heavily weighted financial sector invested its initial losses to end up unchanged. The movements in Australia came after a week of political turmoil that culminated with former treasurer Scott Morrison establishing himself as the country's sixth prime minister in the last decade. Wall Street ended the last session of the week in positive territory. The Dollar fell against most of its major counterparts on Monday as risk appetite rose. The attitude of investors was supported by the statements of the Federal Reserve Chairman. At the Jackson Hole symposium, President Powell emphasized the central bank's intention to raise interest rates, despite recent criticism from Trump. Powell argued that gradual increases in interest rates are the best way to protect America's economic recovery, keep job growth as strong as possible and keep inflation under control. Oil prices fell slightly on Monday, due to concerns that the U.S.-China trade war will negatively affect global economic growth. Imminent U.S. sanctions on Iran's oil sector prevented the oil from falling further. Gold prices remained stable on Monday in Asia after peaking to a year ago level, as Federal Reserve comments affected the Dollar. S&P 500 and Nasdaq close at record highs with Netflix jumping. The S&P 500 and Nasdaq reached record highs on Friday, August 24, when Netflix shares soared. The market as a whole also rose because the Federal Reserve has appreciated that the U.S. economy is strong. The feeling that there are still prospects of rate hikes is growing stronger. Session in the Europe was slightly bullish on Friday 24th August, although there has not been much movement as the weekly highs have not been exceeded. Everything has been virtually flat throughout the session, waiting for what the Federal Reserve Chairman had to say at the Jackson Hole symposium. In the end, the prospect of further interest rate increases is anticipated. 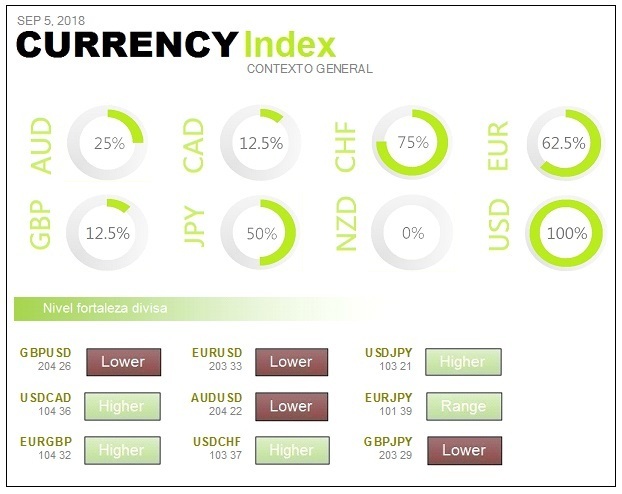 The biggest movement has been in the forex market, where the dollar has continued to lose strength, closing one of the worst weeks of this year. It may be that, in the current situation, the European Central Bank and the Bank of Japan will start thinking about rate hikes. This would affect both the euro and the yen, causing more movement than the dollar. Powell said he believes the possibility of interest rate hikes is advancing. He said the U.S. economy is strong and can handle a more restrictive monetary policy. The market wasn't sure how aggressive it was going to be. Surely, the most important thing about the speech was that he did not see inflation rise significantly above 2 per cent. The Fed's Bullard has also acknowledged that it is not good to rush a rate curve reversal and that the pace of interest rate hikes should be allowed to take its natural course. This has also been reinforced by other comments and they also say that the current pace is right. For the time being, as soon as the chairman of the Federal Reserve spoke, the US yield curve has fallen to its flattest level since 2007. Elon Musk, Tesla's CEO, has decided that the Electric Car Company will remain on the public stock markets. In a message published personally on the company's blog, he explained that the company's investors had convinced him to make this decision. It was known that the privatization process would be a challenge and that more time would be spent than initially anticipated. This was a problem as they must be focused on being profitable and increasing the Model 3. The German economy regained momentum in the second quarter of the year, boosted by domestic consumption. The data confirm the estimates, still provisional, released ten days ago and reflecting a sustained boost in German GDP. As a result, the euro's largest economy has been more dynamic than the rest of the euro area, which grew by 0.4% between April and June. Asian markets rose on Tuesday, August 28, after another day of record highs on Wall Street, when the United States and Mexico announced a new trade deal. The Nikkei 225 was on positive ground, with an increase in the country's shipping sector. South Korea's Kospi was also in positive territory, with the technology sector being the best. The ASX 200 recovered from last week's turbulent political situation. Both the Shanghai composite index and the Shenzhen composite index remained almost flat. Wall Street shares rose after the agreement between the United States and Mexico, reached after months of negotiations between the two countries on the future of the North American Free Trade Agreement. Although not currently part of the announced agreement, Canada is likely to join as well, according to former Canadian negotiator Debra Steger. Positive risk sentiment was reinforced. The Dollar fell to its lowest level in a month against the EUR on Tuesday, but rose against the Yen after a boost in risk appetite. Oil prices rose on Tuesday, as risks of supply disruptions from producers such as Venezuela, Africa and Iran boosted expectations of a tighter market. Gold fell during Tuesday's Asian session from its two-week high in the previous session. The dollar appreciated against the yuan making the precious metal more expensive for the Chinese, who are the largest buyers of the precious metal. Bullish markets opening in the US on Monday 27th August. We are following in the footsteps of America last Friday, which has improved the situation in Asia and had a positive impact on Europe. Remember that the Fed chairman's speech was positively accepted, saying that the best way to proceed was to keep up the pace of rate hikes to protect a strong economy and the labour market. If we add to this the fact that Trump has made favourable comments about the negotiations with Mexico, the situation of fear of the trade war has also decreased. The tension over the trade war is dropping quite a few notches. Was a bullish session in Europe on Monday 27th August, at a good start to the last week of the month. The good news is that there is a beginning of an agreement between the United States and Mexico. The data on business confidence in the IFO Institute has been known, which has been better than expected and rising since the previous reading. They do so in the context of the renegotiation of the North American Free Trade Agreement. This principle of agreement focuses on the car industry, but leaves out other contentious issues. However, a preliminary agreement between the two countries will not really be able to revise NAFTA, because this principle of agreement still excludes Canada, which is the third party to this agreement. The country chaired by Justin Trudeau has been absent from talks in Washington in recent weeks. A new treaty will depend on Canada's return to negotiations. Crude oil is trading between declines and gains, as commercial tensions continue. In addition, investors are concerned about possible sanctions against Iran for failing to comply with production cuts. This week there will be a conference of the committee that will follow if the requirements for production cuts between members of the Organization of Petroleum Producing Countries and non-members are met. The fall of new facilities in the United States and last week's fall in U.S. inventories, support the rise in oil prices. U.S. energy companies reduced nine oil drilling rigs last week, falling to 860, the largest reduction since May 2016. The economy of the Organisation for Economic Cooperation and Development is accelerating and leaving Europe behind. Compared to the second quarter of last year, OECD GDP grew by 2.5%, compared to 2.6% in the previous quarter. This is one tenth less, as a result of lower year-on-year growth in the eurozone and Japan. Between April and June, quarterly growth in the United States accelerated to 1% compared to 0.5% in the first quarter. In the debt market there is money outflows practically everywhere. It means an increase in interest rates, due to the positive perception of the trade war that is helping to increase the demand for risk. In the forex market, the dollar is rising, but the same is not true of the yen. The euro is not having the day either, as it is not being supported by confidence in Germany. Asian markets traded on mixed territory on Wednesday, August 29, after the Nasdaq and the S&P 500 set another Wall Street record as trade fears eased. The Japanese Nikkei 225 is up, with the shipping industry being the best. South Korea's Kospi also traded higher. The ASX 200 climbed up at the end after being flat during the session. Mainland China's markets were negative. If we look at the market in general, and at the situation in China in particular, the picture is not clear because we do not yet know what the next step in the trade dispute between Washington and Beijing will be. The S&P 500 extended its gains to close at another record high. The NASDAQ Composite also set an all-time record. Canadian Foreign Minister Chrystia Freeland arrived in Washington Tuesday to resume talks on the future of the North American Free Trade Agreement, the day after the United States and Mexico announced they had reached a new trade agreement. The Dollar rose sharply during Wednesday's Asian session after falling to a four-week low. However, the relief from the U.S.-Mexico trade agreement was tempered by concerns that the U.S.-China trade war could continue for some time. Oil prices were on the rise, driven by falling supplies in Iran and increased production outside the Organization of the Petroleum Exporting Countries. Gold prices rose sharply during Wednesday's Asian session after falling from the previous session. Rising interest rates and continuing trade tensions between China and the United States continued to influence the market. Wall Street sets new records after the agreement between the United States and Mexico. The market reacts positively to the trade agreement between the United States and Mexico, both countries are about to close a trade agreement for the next 16 years. Wall Street recorded moderate gains on Tuesday 28 August, allowing the S&P 500 and Nasdaq to record new highs after the last two sessions. It has been known the advanced reading of the trade balance of goods in the United States. It increases the deficit drastically, showing more power of internal consumption. This is good news for the economy. The Old Continent is listed in green on four of its five main indices. On Tuesday 28th August the Ibex moved further and further away from 9,700 points and is now struggling to maintain its 9,600 points. In the foreign exchange market, the euro is more powerful than the yen. Exporters are benefiting in Europe and, with the fall of the dollar, raw materials continue to improve. This makes the basic resource supersector the best of the day, followed by automotive and parts. The European Central Bank's expansionary monetary policy has proved effective in stabilising the eurozone economy. Also in creating the conditions for a sustained adjustment of inflation towards the Institution's target of just under 2%. At this point in the cycle it is important to closely monitor the risks of this policy. A patient, prudent and persistent monetary policy is still needed. At the same time, the risks must be closely monitored. A sound, comprehensive and prudential macro-prudential framework that complements monetary policy is essential. U.S. Treasury Secretary Steven Mnuchin said he sees no problem with Canada joining the new North American Free Trade Agreement. However, if it does not, the United States will continue with a bilateral agreement with Mexico. The Italian Vice-President, Luigi Di Maio, does not rule out the possibility that the country will exceed the ceiling of 3% of its deficit, in relation to the gross domestic product, established by the European Stability and Growth Pact for all EU countries. ‘We can't say it now, as we are still working on the general budget'. ‘If we need it to achieve our objectives, we will have access to the deficit investments'. The US President and the German Chancellor agree on the need to improve trade relations between the United States and the European Union, following the escalation of tension in recent months. Both strongly supported the ongoing discussions between Washington and Brussels, which are taking place to remove barriers and to achieve a deeper trade relationship. Relations between the United States and the European Union are not at their best, following Trump's decision to end the duty-free treatment of steel and aluminium towards its European partners and the subsequent response from Brussels. In addition, the US president has threatened to impose a 20% tax on all imports of vehicles arriving from the European Union. Asian markets were mixed on Thursday 30 August, when two telecoms companies, TPG Telecom and Vodafone Hutchison Australia, announced their plans to merge. The Nikkei 225 climbed to its peak of over three months. The ASX 200 improved, supported by the telecommunications sector. South Korea's Kospi was quoted almost unchanged. The latter index reached an intraday high following the news that the President of the United States had facilitated the selective easing of steel and aluminium quotas in some countries. Investors' sentiments were also boosted by the announcement that Canada had rejoined the NAFTA negotiations, following the agreement reached by the United States and Mexico earlier this week. The British pound held firm during the Asian session, after achieving its biggest rise of seven months the previous day. It was supported by the European Union's offer of a post-Brexit partnership. The pound soared as fears of a tough Brexit dissipated after Michel Barnier announced an accommodating stance towards London in the ongoing talks. Barnier said the European bloc is prepared to offer Britain a trade partnership, but not a single market, after the Brexit. Oil prices rose on Thursday, extending solid gains from the previous session following a drop in U.S. oil inventories and expected supply disruptions from Iran and Venezuela. Gold prices fell on Thursday's Asian trading session, as U.S. interest rates are expected to rise. It managed to stay above the psychological level of $1,200, which was a strong support. U.S. growth revised upward in second quarter. The Gross Domestic Product of the United States grew by 4.2% in the second quarter of the year. This is one tenth more than initially recorded, despite the fact that consumer spending has been revised downwards. In contrast, government spending has increased by two tenths of a percentage point to 2.3 per cent, driven by military spending. NASDAQ helps Europe move away from minimal doubts. Was a slightly positive session in Europe on Wednesday 29th August, but with problems due to Spain's exposure to emerging markets and volatility in Italy. Foreign trade declined in the G20 between April and June, after eight consecutive quarters of growth. This is partly due to the sharp depreciation of the currencies of some large emerging countries against the US currency. Imports from the G20 countries declined overall, while exports also fell. All this was partially offset by the increase in the price of oil, which, in the case of Dubai crude taken as a reference, rose from an average of 64 dollars to 71.6 dollars. The president of Deutsche Bank, Christian Sewing, said the cause of the crisis in Turkey is the country's high foreign debt. Sewing added that the drama with which the crisis in Turkey has worsened has been unexpected. We have yet to see the evolution of the financial markets, which are going to be heavily influenced by political decisions, often very populist. France's gross domestic product grew in the second quarter as it did in the first. Between April and June consumption fell by 0.1%, after having risen by 0.2% between January and March. Conversely, public spending rose by 0.3% in the second quarter, after rising by 0.1% in the first. Rates are rising almost everywhere, except in Italy, which could ask the European Central Bank to increase its purchases of debt under the quantitative programme. Some rating agencies have suspended the review of the Italian rating, pending greater clarity on the new government's spending path. We must remember that the problems that have arisen in Italy are due to the formation of a populist government that seeks a direct confrontation with Europe. If the European Central Bank agrees to finance an increase in yields, we would be paying out of all proportion to the outbursts of that government. Italy could also have approached China to seek buyers for its debt, and the United States could have offered to buy part of that debt. Everyone is aware that we are not only talking about debt, but also about intervention in a country that is seeking a confrontation with the European project. To buy its debt would be to support that confrontation. On Friday, August 31, Asian markets fell as Wall Street ended its four-day winning streak after Trump expressed his support for moving forward with tariffs imposed on China. The Nikkei 225 recovered from some of its previous losses, but still traded lower with most sectors falling. At the Kospi in South Korea, Samsung Electronics supported with its rise. The ASX 200 lost, with the telecommunications sector being the worst. The previous session saw gains, supported by the merger between TPG Telecom and Hutchison Telecommunications. In China, markets continued their downward trend of recent days. The Chinese Ministry of Education detailed a plan to increase regulation and control over the number of new online video games. On Thursday, Wall Street ended a four-day winning streak. All indices fell, after reaching record highs in previous sessions. The moves in the United States came after it was known that Trump said he supports moving forward with the imposition of tariffs on an additional $200 billion on Chinese products. The Dollar held steady against most of its major currency rivals on Friday, as tensions in U.S.-China trade affected risk appetite. Weak emerging market currencies drove the dollar higher. Oil prices fell on Friday amid concerns that the U.S.-China trade war could escalate. Imminent U.S. sanctions against Iran's oil exports prevented prices from falling further. Gold fell on Friday's Asian trading day as the dollar held firm amid expectations of higher interest rates and continued trade tensions. Gold had its fifth consecutive monthly decline in a row. The Federal Reserve has a free hand to further rates increases. On the macro-US front, unemployment claims remain very low on Thursday, August 30. Inflation is rising, so there is more support for the Federal Reserve to continue to see that the right way forward is to gradually raise interest rates. Yet another day, technology is the one that is keeping the upward momentum in the United States, with Amazon exceeding $2,000 per share. On the other hand, the materials sector and the consumer sector are also involved. Something is happening in the U.S. housing market because there is a lack of good performance, both in new and second-hand home sales, due to the rise in mortgage rates. It was a negative session in the European market. On Thursday 30 August there will be a combination of factors that will have a negative impact on Europe. The news that Canada was meeting with the United States to reach an agreement within NAFTA benefited certain areas. However, the situation with China does not look good. There are many factors of economic slowdown in the euro area. Besides, inflation is coming in. Assurance that the Federal Reserve will gradually raise interest rates is the best way to sustain the economy. Both the Bank of Japan and the European Central Bank will be forced to change their monetary policies. Being on the way of a change in monetary policy in the euro area and, at the same time, a reduction in the forecasts for the real estate sector do not make for a favourable combination to improve the economic situation in Europe. The prospects for Amazon and Google are growing. The market continues to be influenced by increases in dividends and buybacks of own shares as a result of the tax reform. Corporate profits also continue to rise, as a side effect of this reform. Problems in China when a survey in Reuters showed that a reduction in industrial activity is expected in the third quarter. This is due to a poor combination of two factors: increased uncertainty among exporters and weaker domestic demand. The difficulties posed by the trade war with the United States are taking their toll in the Asian country. The unemployment rate in Germany was 2,351,000 people out of work. This is 0.1% more than in July and is a typical rise in the summer recess. Corrected for seasonal effects, the number of people without work fell from July to August by 8,000. Compared to August last year, the number of unemployed fell by 194,000. The labour market continues to develop favourably. Asian markets were negative on Monday 3 September. Canada and the United States failed to reach a trade agreement last Friday and concerns about a further escalation of the U.S.-China trade war are growing. The Japanese Nikkei 225 traded in negative territory, as most of its main sectors were on the decline. In Australia, the ASX 200 reduced its previous gains to a flat level. China's markets fell in the middle of the Asian session. However, some investors claim that the fall in Chinese stocks is potentially unjustified. Companies operating outside China have been unfairly disadvantaged. Commercial disputes are supposed to be influencing companies doing business outside China and they are likely to be harmed. This week, talks between Ottawa and Washington will continue. The U.S. president notified Congress last Friday that he wants to sign a trade agreement with Mexico and Canada in 90 days, which is the legal period required for the NAFTA agreement to be revised. At the same time, if trade tensions with China worsen, this could affect emerging market currencies. Despite commercial tensions, US equities have seen their best performance in August in recent years. The Dollar held steady during Monday's Asian session, benefiting from its safe-haven status. Investors took the impasse in the U.S.-Canada trade negotiations as a bad sign for the even more difficult U.S.-China talks. Oil prices fell on Monday amidst rising OPEC and U.S. supply, overcoming concerns that falling Iranian production will drive up prices. During Monday's Asian session, gold fell below the technical level of $1,200. A strong dollar, due to concerns about the possibility of more tariffs between the United States and China, is exerting its influence. When the bilateral agreement between the United States and Mexico became known, the market took it very well. But all that is behind us now. Canada's rush to reach another deal and not stay out of NAFTA was also positive, but clouds appear on the horizon that include information that Canada and the United States would not be able to reach an agreement before the deadline. Mexico and the United States were used by operators to extrapolate some optimism to the rest of the conflict zones, China and Europe. In fact, remember that the European Union said that the majority thought that tariffs could be reduced to zero, that is to say, completely eliminated. Trump also said that if the World Trade Organization is not modernized, he is in favour of removing the United States from it. In addition, Wall Street will be closed on Monday 3 September for the Labour Day holiday. The tension of the trade war has taken over Europe again. The United States has tried to play its usual role on Friday 31 August, saving the furniture in Europe and trying to reverse the situation. But it was not possible, as the selling intention in Europe was too clear. The price of energy and fresh food are responsible for the drop. In August, energy prices rose 9.2%, compared to a year-on-year increase of 9.5% in July. Meanwhile, the price of fresh food has risen by 2.5%. That's a tenth less than the month before. Excluding the effect of energy, the inflation rate in the euro area stood at 1.3% in August, compared with 1.4% in July. Excluding also fresh food, prices have risen by 1.2%, one tenth less than the previous month. The unemployment rate in the euro area remained stable in July. It is 8.2%, while in the European Union it fell by one tenth to 6.8%. The Chinese government has adopted tax reduction measures to support the development of the real economy. This decision coincides with the trade war between China and the United States, which could affect the economy of the Asian giant. Initiatives include tax reductions or exemptions for industries that have had to stop production due to overcapacity, as well as improvements in export refunds. The value added tax exemption will also be extended to lenders' interest in SMEs. Another measure in the same direction will exempt foreign institutions investing in the domestic bond market from corporate income tax for three years. The president of the United States has accused big technology companies such as Google, Facebook and Amazon of taking advantage of a possible situation of unfair competition. At the same time, he has accused Google of manipulating his search engine to hide positive news about his figure. The giant has responded by demonstrating that it had issued Trump's latest institutional speeches. The country's 10-year bond yield has soared to 3.2%, its annual highs. The risk premium remains above 280 points. It's a touch of reality for Italy. The Italian Minister of Economy issued a warning to the politicians in the government coalition, saying they should moderate themselves when speaking so as not to create instability in the public accounts. There has been a significant rise in rates which means that they have to spend more money on public financing. Italy could ask the European Central Bank to increase the quantitative programme to avoid downgrading the debt. This movement may not be supported by other countries, as Italy's turbulence is created by the off-key declarations and intentions of its politicians. Asian equity indices were mixed on Tuesday, September 4, with uncertainty over trade disputes and emerging markets. The Japanese Nikkei 225 traded lower, with most of the major sectors turning around. The South Korean Kospi showed a positive tone. Hong Kong's Hang Seng index lost its previous gains and remained stable. Both the Shanghai compound and the Shenzhen compound also lost their initial gains and were flat. Australia's ASX 200 continues to operate in negative territory, with the financial sector being the worst. The Reserve Bank of Australia announced that official interest rates would remain unchanged at 1.5 per cent. This decision was expected by most observers. A poll released Monday showed that China is beginning to suffer some negative effects from its trade war against Washington. The Caixin Markit PMI Purchasing Managers' Index stood at 50.6, its lowest level since June 2017. In addition, export sales fell for the fifth consecutive month. One of the main economic focuses of the week is the expected resumption of negotiations between Canada and the United States on the future of NAFTA. They do so after the two nations failed to reach an agreement last week. U.S. markets closed on Monday for Labour Day. The U.S. dollar rose as much as the Australian dollar during Tuesday's Asian trading session, as the Australian central bank left interest rates unchanged. 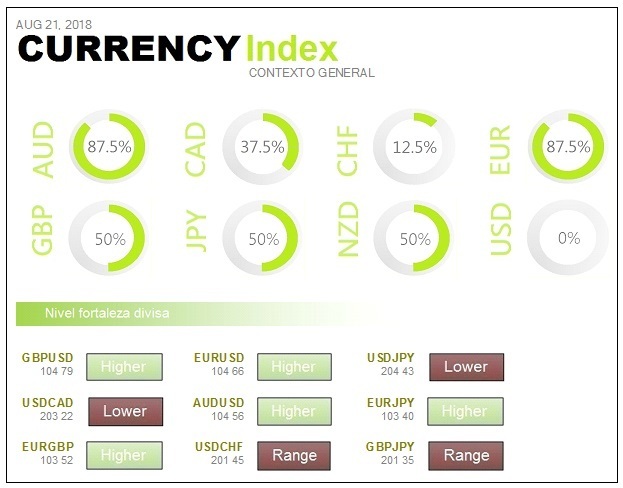 It appears that the USD and JPY, the typical safe-haven currencies, are supported by the confusion of the rest of the world. Oil prices in the United States rose on Tuesday, exceeding $70 a barrel. They do so after two oil rigs in the Gulf of Mexico were evacuated in preparation for the arrival of a hurricane. In Tuesday's Asian trading session, gold rose to a one-week high, while the dollar was also strong on the back of intensifying global trade tensions and economic concerns in emerging markets. Monday September 3rd was Labour Day, with the possibility of magnified movements due to lack of liquidity. Was a decaffeinated session with bad macro data. European market with a negative development on Monday 3 September, after last Friday's falls. Commercial tensions are still present and, for the time being, there is no news to alleviate them. The protagonist of the day is the automotive and parts supersector, which is falling by around -1%. Above all, a poor final reading of the August purchasing managers' indices for the manufacturing sector came out. One thing that is helping to contain the situation is the good performance of the secondary debt market on the periphery of the euro area. The future of Italy's 10-year debt is rising by more than 50 points. This is helping the Spanish to do something similar, while maintaining neutrality in Germany. The UK Purchasing Managers' Index for August in the manufacturing sector is no exception to the general decline that is being seen in Europe. It went from 54 to 52.8, when the market expected a very slight decline of a couple of tenths. Very bad situation in Argentina, with a very serious economic crisis that will require major adjustments and more poverty for the population, after the country has gone into over-indebtedness. Problems in Brazil and its currency, due to the October elections and political uncertainty. The Turkish lira is very nervous again, with its serious economic situation very present. The Indonesian government has had to intervene to defend its currency, which was at a 30-year low. It is feared that this week tariffs of 25% on $200 billion in Chinese products exported to the United States will come into effect. These days there was a mirage of improvement in the trade war with the agreement between the United States and Mexico. However, the good feelings were short-lived. Trump has taken it upon himself to remember that Canada does not have to have the same agreement as Mexico. The European Commission has sent another signal to get the President of the United States to definitively bury the trade hatchet with the European Union. The potential beneficiaries of the measure would be US farmers and their beef exports to Europe. The Community executive has recommended that the Council of the European Union authorise it to open negotiations with the United States. The aim is to close a dispute, at the World Trade Organization, over this particular product. This would be another act of détente on the European side, in addition to the increase in purchases of liquefied natural gas and soya. Asian markets were largely negative on Wednesday, September 5, after Wall Street recorded losses on its first trading day of the month and emerging markets continued to show a negative tone. Japan's Nikkei 225 traded lower due to concerns about the impact of a typhoon. South Korea's Kospi also showed itself to be in a downward spiral with the fall of Samsung Electronics. In Australia, the ASX 200 continued its downward trend as its main mining companies were operating in negative territory. In the China region, Hong Kong's Hang Seng index also fell. The Wall Street indices recorded losses on Tuesday on their first trading day in September, after Monday's Labour Day holiday. Late Wednesday, Canada will participate in new trade negotiations with the United States after the two sides failed to reach an agreement last week. China could follow a strategy of waiting to see what happens in the coming months before the U.S. midterm elections in November. The trade war is likely to become painful for the United States as well in the near future. The U.S. dollar fell on Wednesday and the Australian dollar, which was at its lowest level since mid-2016, gained ground after Australia recorded its best economic growth in six years. 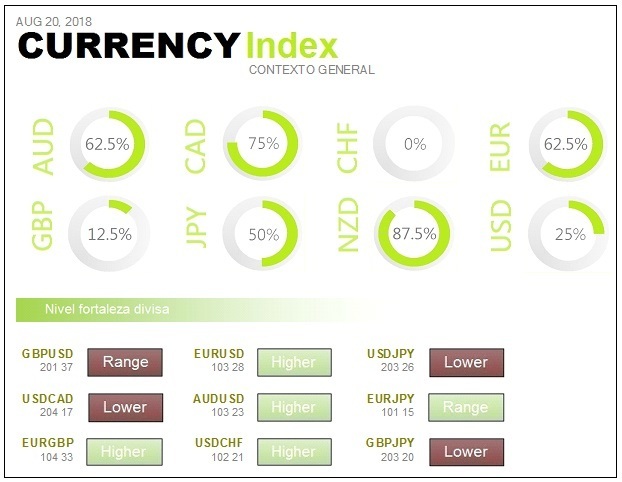 The Dollar's losses against other currencies were largely limited as investors remained loyal to the Dollar as a safe-haven currency due to the cautious nature of the US-China trade dispute. In the Asian session on Wednesday, oil prices rose as the market prepared for possible supply disruptions due to a hurricane off the U.S. Gulf Coast. However, the increases were limited by a report that Cushing's reserves rose last week. Gold prices rose in Wednesday's Asian trading session after hitting a low of more than a week in the previous session. 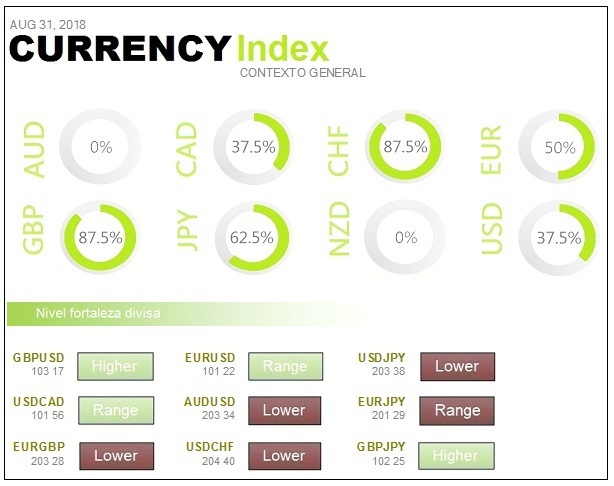 The weakness of the dollar influences the precious metal, despite concerns of an escalation in the trade dispute between the United States and China. The Dow Jones points to historic highs. The Dow Jones reopens on Tuesday, September 4, after the festivity with which the week began. It seems that the index is ready to fill the bullish gap, which was opened on the 27th, before continuing its climb in search of the historic highs of the beginning of the year. Was an unhappy session on the European markets. On Tuesday, September 4, the losses that characterized much of last week resumed. They do it after a break on Monday, waiting for the United States to finish its Labour Day holiday and really start the week and month. The fronts are exactly the same: trade war, macroeconomics and the problems that are emerging in emerging markets. The Central Bank of Australia has announced its decision to keep interest rates unchanged, bringing the total to 25 consecutive months at record lows. The RBA has announced that the price of money remains at 1.50% and has anticipated that future monetary policy will remain stable. Although this decision was expected, the Australian dollar rebounded after Philip Lowe was optimistic about the future of the Australian economy. There are numerous chronicles appearing in recent days that deny what Trump has said. It's entirely possible, given the ongoing investigations into their dark relations with the Russians. Clinton's tribulations took place amidst economic expansion, moderate inflation and a technological boom. The stock market shaken off the Clinton indictment and ended the year with a bang. Nixon's resignation on August 9, 1974, occurred amidst a market collapse. Stocks were already in sharp decline before Nixon left and that trend continued for several months after he left office. In other words, there is nothing to suggest that any of the presidential events played any role in the direction the stock markets took, either before or after. The bad news is that the money coming into the United States comes out of Europe, Asia and emerging markets. 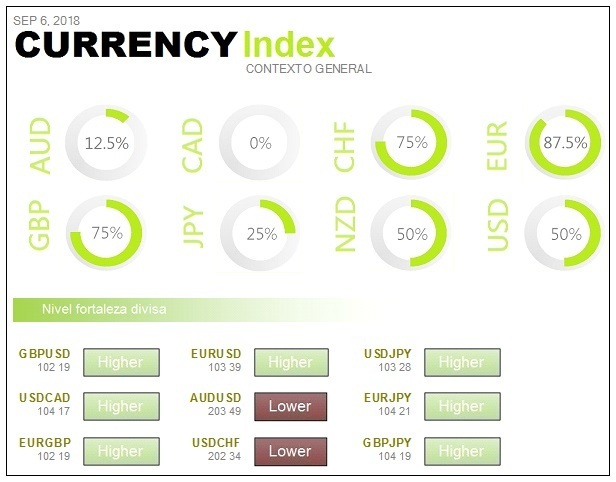 International money flows remain clear and are demonstrated by the strength of the dollar. In essence, the usual concerns about the trade war, which continues to show no signs of improvement, continue, with the market still very much awaiting the outcome of the negotiations between the United States and Europe. The fear of an open crisis in emerging countries, which does not show any signs of improvement, also continues. Crude oil is back above $70 a barrel, after two oil rigs in the Gulf of Mexico were closed in the wake of Tropical Storm Gordon. In Tuesday's session, there will be more shopping in the periphery of the Eurozone. The future of Spain's 10-year debt has risen by more than 30 points and Italy's by more than 120 points. Let's remember that Italy is one of the few countries in the Eurozone that offers a decent average return on its debt, so the market is diving headlong into the market to hunt for some money. In Spain, just when economic slowdowns are appearing on important fronts, there are prospects for tax increases. This is the worst possible combination. Asia's stock indices fell on Thursday, September 6, following the sale of technology shares on Wall Street. The Nikkei 225 experienced a decline, although the shares of the video game company Nintendo recovered slightly from its previous low but maintained a negative tone. South Korean Kospi was flat, but large technology companies such as Samsung Electronics and SK Hynix were still suffering losses. The ASX 200 declined, although the telecommunications sector remained buoyant. On Wall Street, the Nasdaq Composite had its worst day since August. Sales on the Nasdaq and the S&P 500 were led by a drop in technology stocks. Trade disputes continue to be the focus of attention in the markets, with Canada and the United States resuming negotiations on the future of the North American Free Trade Agreement. The current U.S.-China trade war could also intensify in the coming days. The dollar fell during Thursday's Asian trading session, as the pound rose sharply. Emerging currency markets and global trade concerns limited the dollar's losses. The Australian dollar also fell and failed to gain support from domestic macro data, which was slightly better than expected. 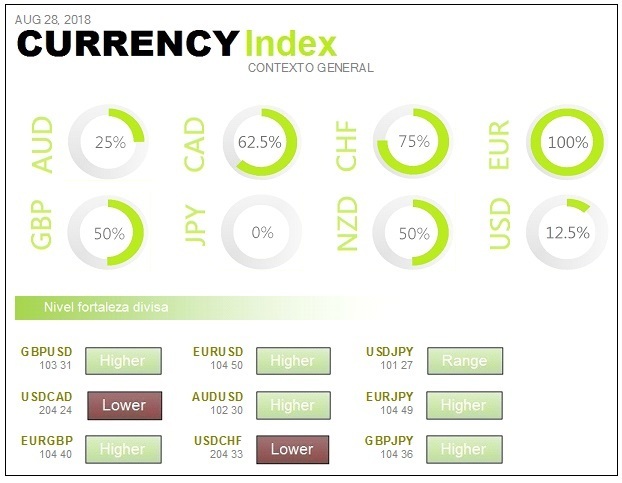 The catalyst behind the dollar's decline was the pound, which shot up after Bloomberg reported on Wednesday that the UK and Germany were willing to give up on a key point in the Brexit negotiations. Oil prices fell during Thursday's Asian session, while emerging market problems weighed on investor sentiment. Also weighing was the approaching deadline for a possible new round of U.S. tariffs on another $200 billion of Chinese products. Gold rose for the second consecutive time on Thursday as the dollar remained weak, making the metal cheaper for buyers of other currencies. It was also supported by good physical demand in Asia. U.S. equities fell broadly on Wednesday, September 5, led by a sharp drop in technology. Investors are also preparing for another round of U.S.-Canada trade negotiations. Technology boosts investors' fears. New bearish session in Europe on Wednesday 5 September, fearing trade negotiations, technology problems and more economic damage on the periphery of the Eurozone. The debt market is clearly rising rates. The only positive point in the whole of Europe is the behaviour of Italy's debt, whose future on ten-year debt is rising by more than 120 points. This means that Italian banks are pulling on the entire financial sector. It is precisely the banking supersector that is in the positive. However, the escalation of its trade war is depressing the economies of the rest of the world. Multilateral agreements are becoming bilateral agreements and are pressuring other countries to accept Trump's demands. The risk is that Trump's policies may be causing a widespread crisis in emerging markets. This is the biggest increase since 2015. The data suggests that global demand is slowing, thus curbing appetite for U.S. exports. At the same time, the upturn in economic activity in the U.S. increases the purchases of the Americans themselves. This is the biggest increase in this indicator in a single month since 2015, and is the highest in the last five months. Danièle Nouy, President of the European Central Bank's Supervisory Board, has warned that the next economic crisis will be linked to the real estate market. He also assured that banks are now much better prepared than they were a decade ago. The regulator has warned that variable interest rates are at risk because there is no guarantee that, when they rise, company profits or workers' salaries will also increase. The volume of retail trade in the euro zone fell by 0.2% in July compared to the previous month. In the case of Spain, they show a monthly decline of 0.9% and a year-on-year fall of 0.8%. Sales of textile products advanced at the same pace as pharmaceutical products. On the other hand, food and tobacco fell. Electronic goods also fell.